Are you of those who enjoy bike rides and love to explore surroundings while on the go? Do you often feel annoyed with the constant rattling of water bottles tied to the bike? Whether you are a professional cyclist or an amateur, every bike rider has to have a water bottle to stay well-hydrated at all times. For that, you will need your best bike water bottle holder to hold your bottle throughout securely. There are loads of expensive as well as affordable models flooding through the market. Some of them are prioritized for their lightweight and ease of access, whereas others are preferred for their security! Some come in a single piece, whereas others in a pair of two. Which one to choose? It’s a tough call. 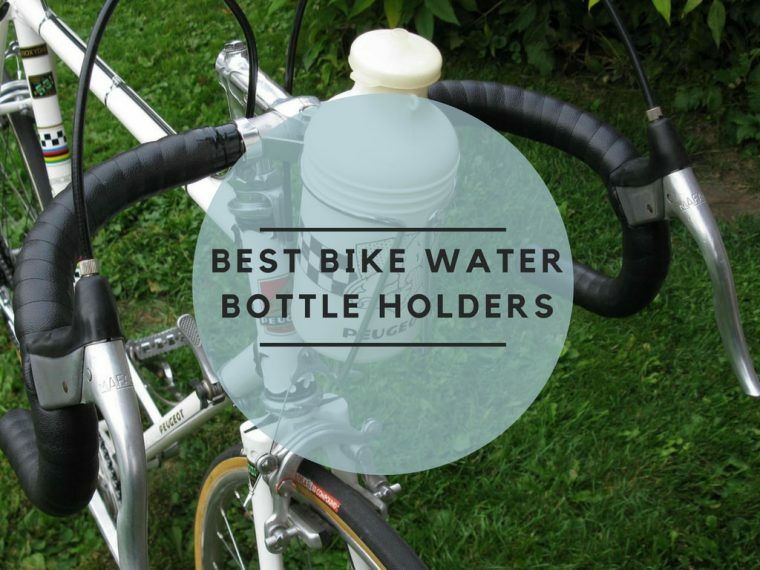 To help you make an absolute decision, we have reviewed Top 5 best bike water bottle holders here with complete details and a buyer’s guide as well. UShake brand is known to manufacture exceptional quality of products, deliberately for professional and enthusiastic cyclists, swimmers, runners and other athletes. A young team manages UShake, and they meticulously work to design premium product lines that excel in style, convenience, and comfort. One of such favorite product viz. best bike water bottle holder is this UShake Bike Water Bottle Cages. Its price falls between the range of $10 to $15, and you get a pack of 2. The cage has been shaped by a high-grade 6061-T6 Aluminum alloy that’s light in weight (just 2.1 ounces) yet extremely strong and durable. To enhance its resistance against scratch, the cages are treated with anodic oxidation. Thereby, making its black surface almost immune to chipping. If you are worried about dropping the bottle, UShake Cages are designed with two arms that wrap around the bottle snugly to prevent it from falling during rides. The holder can accommodate bottle with maximum 3” of diameter (approx. 26 oz.). The cage in itself is designed to be convenient and fits almost all standard sizes of bottles. For easy reach, you can mount it on the front bar of the bike. UShake assures the quality of the cages as it backs it with a notable 10 years of warranty period. For ease of installation, the package comes included with 4 x M5 x 12 screws and 1 Allen wrench as well. Myriads of customers have found UShake Bike cages to be very easy to install, and most of the bottles fit perfectly in the cage. Users who could not fit-in their bottles just bent the cage effortlessly, to wrap it around the bottle tightly. The best thing about this product is that it comes with the mounting gear viz. 4 washers, four hex screws (standard size) and an Allen wrench as well, say, users. All in all, these are well-made and solid bike cages, offered at a very decent price. The winning combo of the 6061-T6 aluminum alloy is well-recognized for its durability, strength and lightweight nature. 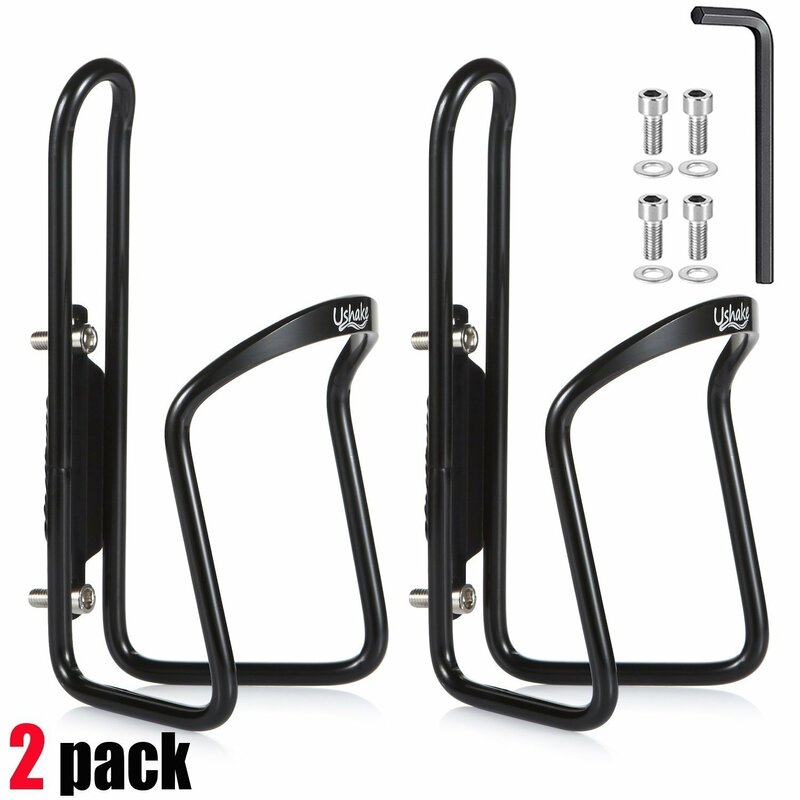 At such a low price, UShake provides two bottle cages in the package. As per your liking, you can either mount them on the same bike or two different bikes as well. The cage holds the water bottle very snugly and is built to last for the longest time possible. Seeing its exceptional features, UShake Bottle Cage is the editorial choice. If you are a cycling aficionado or someone who rides a lot, check out this bike water bottle cage by Pro Bike Tool. Irrespective of the road conditions, this bottle cage will hold the bottle tightly without letting it slip. Not just in quality, but this bottle holder is superior in style and durability as well. Although a little pricier than other products in this water bottle holder review, the Pro Bike Tool Bottle cage is constructed with perfection in every minute detail. Bottle holders can downgrade the look and aesthetics of your bike if it does not match with its paintwork. But that won’t be the case with this particular bottle holder. Pro Bike Tool bottle cage is crafted from CNC machined aluminum alloy and then heat-treated to make it lightweight and sturdy. As for finishing, it is powder coated, and high tumble polished to add beauty to the look of your bike and match with its sleek paint. And, it's a breeze to clean this cage, wipe it a clean cloth! Ideally, this cage works excellent with touring, hybrid, mountain, road and electric bicycles. 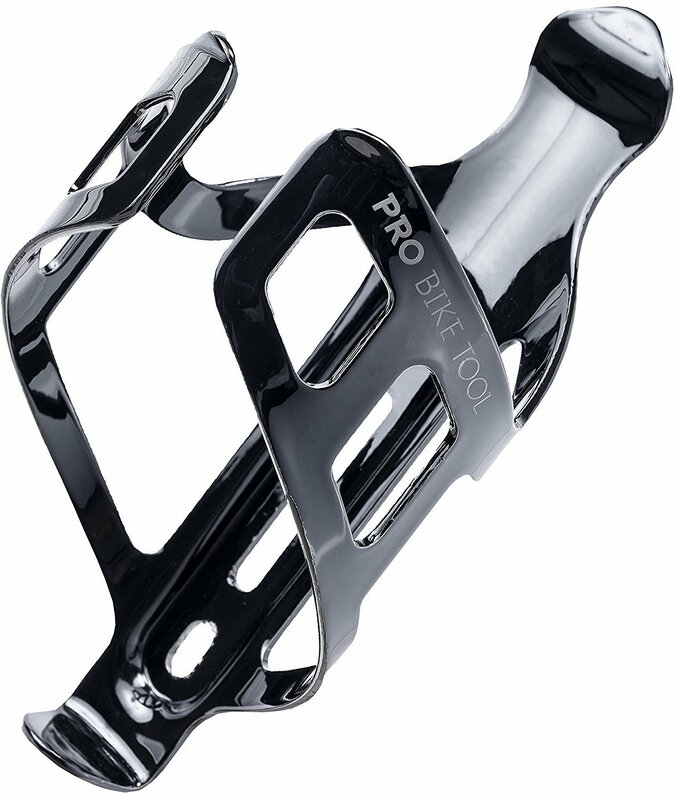 Pro Bike Tool bottle holder features a unique and highly flexible one-piece design. You can swiftly adjust it up to +/- 0.2 inches to accommodate large or small water bottles. To be precise, it is compatible with most of the oversized and standard water bottles (from 500 up to 950 ml sizes). Weighing just about 1.69 ounces, the bottle cage sure does not add extra weight to your bike. The complete installation process takes about 1 minute, and it comes included with 2 Stainless steel bolts. Customers rave about how Pro Bike Tool cage tightly holds the water bottle in all road conditions, even while going on trails. They’ve also liked the shiny powder coating and tumble polishing on the cage, makes it look stylish on the bike. In a nutshell, users have found Pro Bike Tool bottle holder to be of high quality, lightweight, easy-to-install and extremely functional. Just by the looks of it, you can tell that Pro Bike Tool is precisely engineered to be a reliable, secure and stylish companion for your ride. It will securely hold most of the standard sized bottles and even allows adjusting of cage up to +/- 0.5 cm. Two oval mounting holes allow you to fine-tune the position of cage on your bike frame as per your liking. Its robust and sleek aluminum alloy construction and powder coated finishing are unbeatable. Hands-down, it is one of the best bike water bottle holders, especially for bumpy rides. People have this misconception that aluminum bottle holders and cool aesthetics don’t go hand in hand. With this classic bottle cage, Ibera brand has proved them all wrong! Design of this cage is minimalistic, yet very stylish and functional. Nothing feels cheap here. Ibera has shaped this bottle holder in a unique oval design to fit most of the standard sized bottles and a few large-sized bottles. 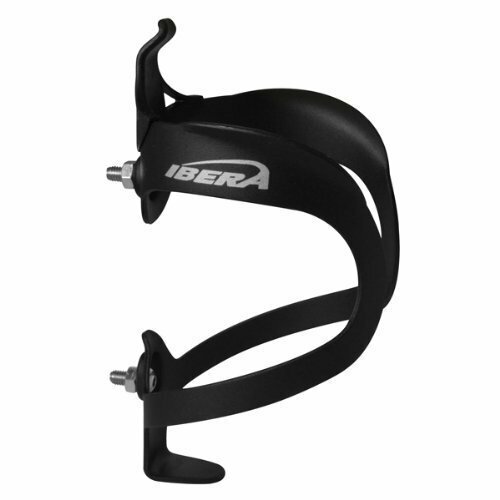 Ibera offers this cage in 4 different color hues, i.e., White, Silver, Carbon Pattern and Black to match with most of the bike frame colors. Made from the heat-treated 6061-T5 aluminum plate, this bicycle bottle holder highly speaks of its robustness, lightweight and longevity. For ease of installation, it comes with stainless steel screws. With the weight of just 43 grams, this ultra-thin bottle holder is Ibera’s lightest model so far. Ergonomic design aspects of the cage provide ease-of-access to the users. In truth, Ibera bike water bottle cage measures 5.50” in height and 3” in diameter. Customers’ take on Ibera bottle cage is that it is super light, robustly made and very easy to install. As for holding the water bottles, it does a pretty good job. The bottle stays-put lovely and tight all throughout the ride, say users. However, many customers have complained about its finishing being rough, paintwork coming off and its color transferring to the bottle. We can say that Ibera brings forth one of the highest quality of bike water bottle holder, given its solid construction and design aspects. The professional-grade 6061-T5 aluminum material is known to last longer, whereas the unique oval shaped design is less liable to unnecessary bending. If you are low on budget, rest assured that you won’t have to pay more than $5 to $11 for this Ibera bottle cage, even for a pair! Yes, it's that affordable! Next up on the line is this exclusive carbon bottle cage by a renowned brand called Wiel. Amongst all the other products in the review, Wiel bottle holder stands out from the crowd with its incredibly durable 100% carbon fiber construction and lightweight design. Wiel bottle holder is designed to accommodate most of the standard sized bottles. Given its lightweight, it is highly suitable to use during road cycling as well as mountain biking. Even on rough terrains, this mountain bike bottle holder will hold the bottle securely, yet gives easy access to the bottle whenever needed. Thus, we can say that it strikes a good balance between security and convenience of the user. Although the cage weighs just about 29 grams, it is resistant against bending and retains its shape well. Shaped from 100% full carbon fiber material, the Wiel bottle cage is remarkably robust, corrosion-resistant and non-deformable. It is designed for standard sized bottles. Too small bottles might not fit firmly into the cage. It measures approximately 150 mm in height and 73 mm in diameter. Worried about installation? 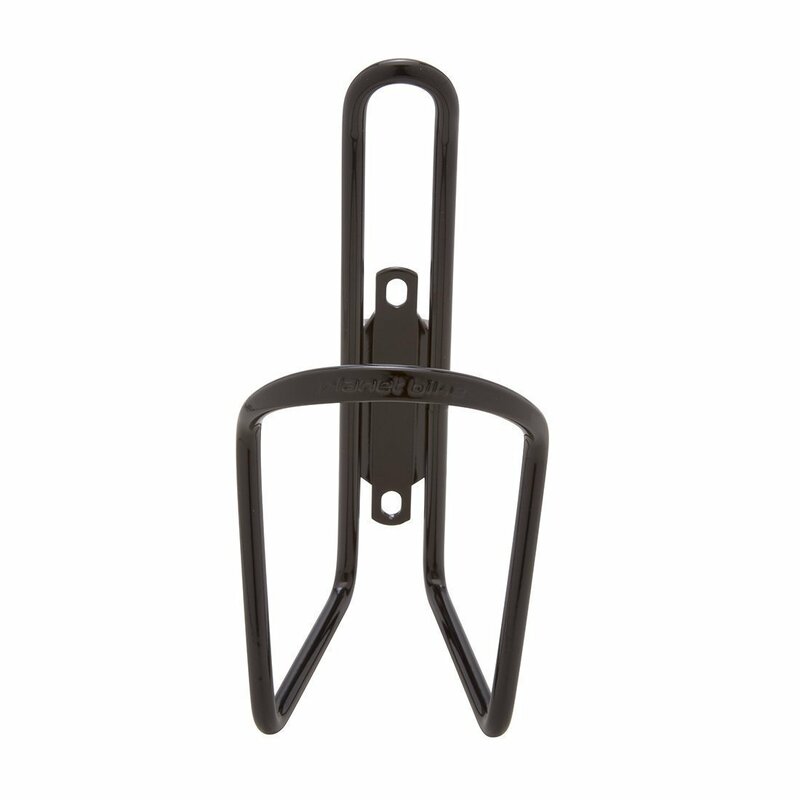 Just like other cages, Wiel bottle holder also comes with two screws. Regarding looks and lightweight design, Wiel bike water bottle holder outshines them all, according to the customers. They’ve also expressed how red and black accents look very appealing and cool on the bike, whereas the bottle fits very tightly in the cage, even when riding on bumps. On the downside, few users have complained about it being a little fragile and not as sturdy as claimed. As compared to commonly-used alloys, carbon fiber happens to be durable and extremely lightweight. Thus, it is suitable for long rides, be it road cycling or off-road riding. As long as you own a standard sized bottle, Wiel bottle holder is going to carry it steadily for you. Another advantage of carbon bottle cage is that it does not lose its shape too. Planet Bike has been in the bicycle gear business for more than two decades now. Not just manufacturing bicycle accessories, but Planet Bike’s primary aim is to encourage people to use bicycles more often. For those of you who don’t know, the 25% share of company’s profits goes to facilitate and promote the use of bicycles. That’s right! That’s how passionate they are about bicycle usage! Planet Bike engages in making the innovative and superior quality of bicycle accessories. While it is a small company, it is still one of the best in the market. If simplicity is what you seek, then have a look at this Planet Bike Aluminum Bottle cage. With a solid build and clean lines, the water bottle cage sure offers excellent durability and reliable use. Not to mention, Planet Bike facilitates you with ten different funky color options to pick from! Planet Bike bottle cage features “featherweight” 6063 6.2mm aluminum body that weighs only about 63 grams. This welded cage can be mounted to bicycles with or without bottle bosses. Use it for dusty trails or rides on city streets; it will effortlessly carry any standard sized bottle for you. Want to know the best part? Planet Bike has covered this aluminum cage with a limited lifetime warranty for your convenience. Cyclists have found Planet Bike bottle cage to hold any average-sized water bottle pretty snugly. But during off-road cycling, the bottle rattles a lot and might eventually fall off. Hence, users suggest it to be ideal for road or street cycling. In fact, some customers say that it is the best bike water bottle holder for Polar Bear and Camelback bottles. Talking about the cons, some users have found it rather annoying that it does not come with its mounting tools. Plus, it does not allow any adjustability. If you don’t want to dig a hole in your pocket and want a bottle cage mainly for road cycling, this Planet Bike would be ideal for you. It is simple in design, sturdy in construction, light in weight and does what it says! Any standard size bottle will fit securely into the cage. Whether you are a newbie, a professional cyclist or just someone who enjoys riding a bike, staying hydrated is a must for all cyclists. For that, you need to have your water bottle within easy reach, and that's when a best bike water bottle holder comes into the picture! In the market, there are heaps of bottle holders rushing in, and all are made for the same purpose- holding the bottle snugly! Bike cage can add extra weight to the bike, which is not at all desirable for some disciplines. Such bottle cages are supposed to be affixed to front bar of the bike for quick and easy access. Many professional riders prefer such system and use it for long races. You can use a straw to keep yourself hydrated without moving your hands from the handlebar. On the downside, such bottle holder might reduce the aerodynamic properties of your bike. Pro riders (tri or TT riders) cannot risk reducing the aerodynamics of the bike by mounting a bottle cage on the front side. 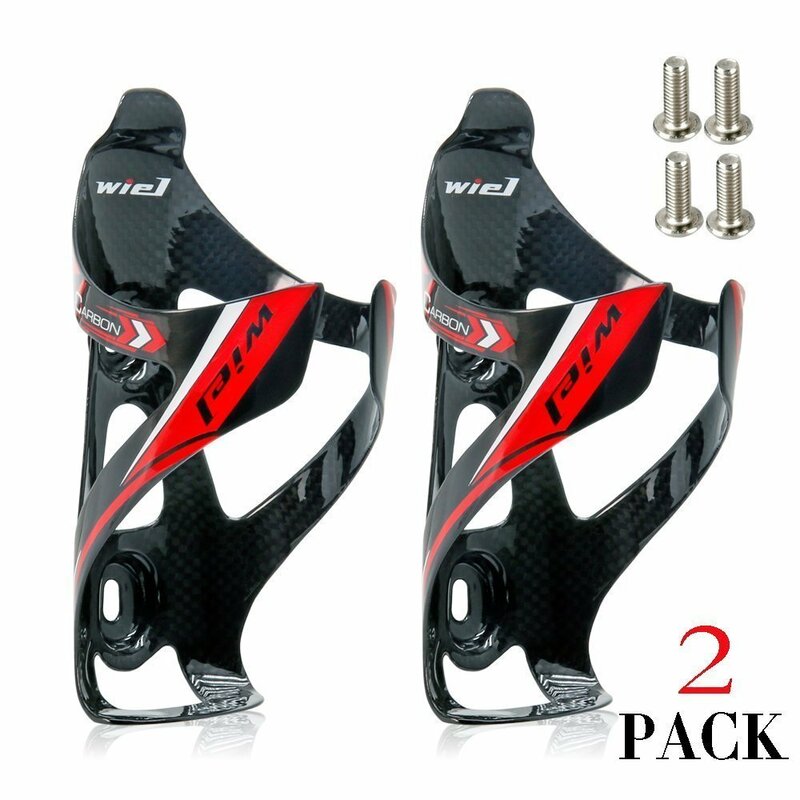 In such situations, it is better to opt for a bottle cage with rear mount system to fix it behind the saddle. Naturally, such position is a little awkward, and the cyclist might find it hard to access the bottle. Bike water bottle holders come in a variety of designs and are made from different materials. Alloy bottle cages are the most traditional ones and have a very minimalistic design. Generally, such enclosures feature tubular alloy designed in a loop shape. You can easily bend it to fit large sized bottles. Apart from this, they are affordable and very convenient to use. However, the main disadvantage of alloy holders is that they add extra weight to the bike’s frame. Which is why you cannot use it for cycling where low bike weight is a vital necessity. To overcome this issue, several manufacturers are now switching to lightweight aluminum alloy as a replacement to reduce the weight of the cage significantly. What’s even more lightweight than aluminum? The answer to that would be Carbon Fiber. Carbon fiber bottle holders are hot on trend nowadays, mainly because of its lightweight properties and stylish aesthetics. As it reduces the weight on the bike and improves its aerodynamics, many professional cyclists prefer carbon fiber bottle holders over others. Whereas, newbies prefer it because of its cool aesthetics. Note that, carbon fiber models carry a hefty price tag as compared to alloy models. The bottle cage is installed on the bike with the help of threaded holes provided in the tubes of most of the bikes. On the cage, there’s a mounting plate with holes, where you can insert bolts. Look for mounting holes that are elongated in shape and not completely round. This way, you can adjust the position of the cage as per your preference. The basic function of a bottle cage is to tightly hold the water bottle, either around its body or collar area. Some models feature wrap-around designs with spring in the material to tightly hold the bottle’s body. For off-roading or rough-terrain cycling, it is better to opt for traditional design of alloy bottle holders for a secure grip. Latest designs are now featuring rubber collars or inserts in the cage to grip bottle’s exterior snugly. This way, road shocks and vibrations will be absorbed, and the bottle won’t rattle much or come loose. Bottle holders that are tight instead become annoying than helpful. A bottle holder must allow easy removal and insertion of the bottle from the cage. To be clear, the holder needs to strike a good balance between ease-of-access and security of the bottle. It can’t be too loose either too tight. Expensive carbon fiber cages are becoming popular day-by-day as it sheds many grams off the cage. But you also need to keep in mind that placing a 500ml or 750ml bottle in the cage will eventually nullify this feature. The question is, will carbon fiber cage provide firm security like that of alloy cages? Not so much. If the lightweight feature is what you seek most, you will find it in myriads of alloy cages along with security. Such cages are highly suitable for road cycling as well as off-roading. Almost all of the bottle holders are made to fit standard sized bottles. Very few models are accommodated in large and small bottles. Look for bottle holders with bottle stoppers. With that, you can easily fine tune the position and fit of the bottle and its retention. One advantage of alloy bottle holder is that- if it ever loses its grip after repeated use, you can easily bend it back into its original shape. Q. How to mount a bottle cage on the bike? Most of the latest bike models come with threaded holes in the frame to attach a bottle cage. These holes are often referred to as braze-on. You can mount the cage to frame with the help of bolts and washers. Standard bottle holder comes with two mounting holes that are 64 mm apart. Some mounting plates have a strap to allow adjustability for large bottles. If not, you can even weld or rivet the cage into the frame. Q. What is the standard size of bottle for bottle cages? Bottle cages are made to hold a standard sized bottle with 73 mm in diameter, which is approximately 5” tall. Q. How to know whether the bottle cage is suitable for your bike? If the cage is oversized, make sure you check whether it is compatible with your bike frame or not. A quick method to check that would be, draw the dimensions of the bottle holder on a paper, cut it out in that precise layout and hold it up against the bike. While doing this, make sure to leave some space for easy insertion and extraction of the bottle from the cage. Most bikes will accommodate a bottle holder with minimum 1 liter of holding capacity. Best bike water bottle holder is the one which will tightly secure the bottle during long rides, biking trails, street rides, off-roading, mountain rides, etc. wherever staying hydrated is a must! Losing the water bottle during long rides is the worst nightmare of a cyclist. Which is why we've reviewed Top 5 best water bottle cage models here that prevent falling off of water bottles. We conclude that UShake provides best bike water bottle holder in the market amongst all the others, given its durability and reliability. Even though UShake Bike Water bottle cage is made from aluminum alloy, it is still one of the most resistant models when it comes to holding all types of standard bottle sizes. Moreover, if it ever loses its shape, you can bend it back to its original form; which is not possible with carbon fiber models. Talking more about its advantages, UShake bottle cage can mount on any bike, is backed with a remarkable ten years of warranty and comes with its mounting tools!